Ends at march 11, 2018. Note that answers will be gathered, analyzed and may or may not be publicly published without consent. Answers given will make no difference in regard to potential rulings in subsequent WCO editions. One player filled in the survey with username " - " please note that without a valid username (verifying uniqueness) the survey will be disregarded. To the player who filled in this survey: Please let us know your username so we can edit this in the survey. Thanks in advance. A small preview of the WCO Survey so far. So far, 34 players have filled in the WCO Survey. Thank you for this! I've seen some interesting ideas and suggestions. Much appreciated! After the survey closes, we will try to incorporate some and may also contact players who made suggestions so we can hear those suggestions even better. Edited by Nortrom, 02 March 2018 - 11:20 AM. A butcher should not rate his own meat! Notice that we gave a full disclaimer who voted. The average mark was above 8. KARAISKAKIS was also a consumer of the service, especially when Nortrom and me were judging him in one of the most difficult cases I have been in for years that involved reading pages of PM messages trying to understand every single word and the meaning in its context. Edited by Morx, 02 March 2018 - 01:53 PM. Ruben, I agree with you. As WCO orga I feel I have a big influence on next year's WCO already and, personally, I want this to be a community / player feedback, even though I was a participant too! To those who filled in the WCO Survey, on behalf of the WCO Team: Thanks! 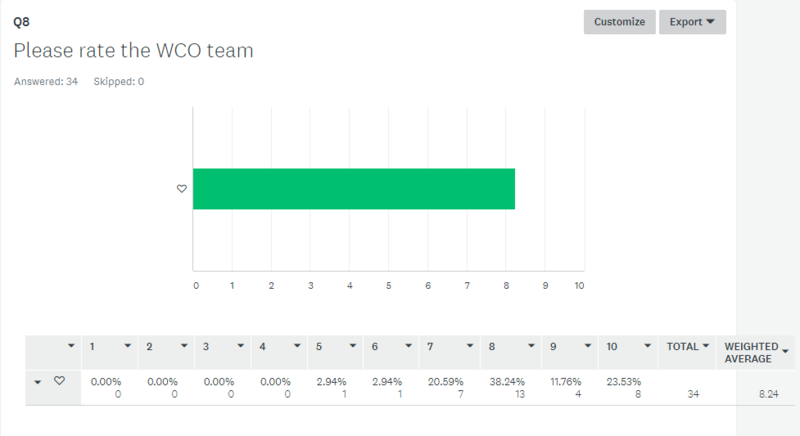 We will look at the survey results, and like during the previous two WCO editions, report back to you, the community.